​​The goal of E.A.S.C. 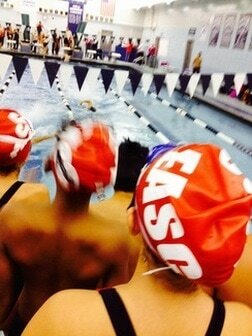 is to create a positive environment that emphasizes sportsmanship, competition, and a love of swimming. The Eisenhower Area Swim Club is a competitive swim team for swimmers ages 6-18 located in Blue Island, IL. The E.A.S.C was founded in 1977 and served as the major swim team in the Blue Island area until 2011, when it disbanded. The team was restarted in 2014 under coaches Taylor Burmeister and Andrea Contreras. The goal of E.A.S.C. is to create a positive environment that emphasizes sportsmanship, competition, and a love of swimming. E.A.S.C. is a member of USA Swimming and competes in the Red Division of the South Suburban Swim Conference.